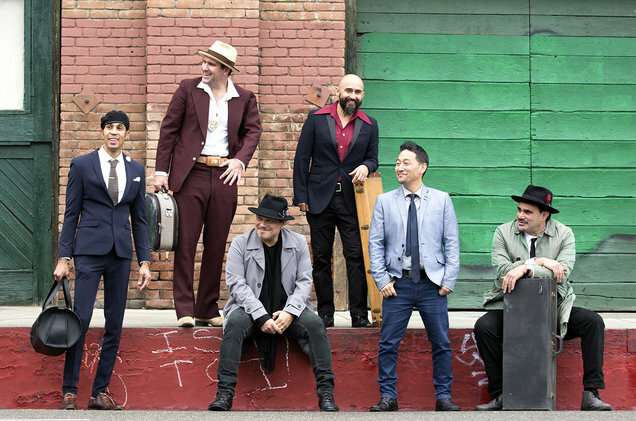 The six members of the Los Angeles-based band Ozomatli pride themselves on living up to the group’s namesake—Ozomatli, the Aztec god of dance. With that in mind, lovers of Latin music, reggae and other world styles—or anyone who likes to dance for that matter—should be sure to catch the band’s upcoming Coach House show on Nov. 26. “We want people to show up and have an amazing time,” said saxophonist Ulises Bella. Since Ozomatli’s formation in 1995, the band has become known for seamlessly blending an array of genres, from classic and modern Latin music, to urban, hip-hop and rock. Bella said their upcoming San Juan show will be no different; they’ll be showcasing some of their older tunes while also playing music from their latest album, Nonstop Mexico to Jamaica, which features covers of popular Mexican songs like “La Bamba,” “Besame Mucho,” and “Como La Flor,” but with a Jamaican twist. Bella said the Jamaican style was a natural fit for the band, as many members had already dabbled in reggae and ska in the past. But what really brought the album together, Bella said, was the involvement of reggae legends Sly and Robbie. Unlike many of their prior albums, Nonstop Mexico to Jamaica is recorded almost entirely in Spanish. When asked if there was any political motivation behind the band’s choice to focus on their Mexican heritage, Bella said delivering a strong political message wasn’t necessarily their focus, but added that connecting people to other cultures is important in today’s politically-divisive world. So what will the New Year bring for Ozomatli? Bella said 2018 marks the 20th anniversary of the band’s first recording, which featured rapper Chali 2na (who’s also known for his work with hip-hop band Jurassic 5). The band plans to re-release that self-titled album next year, as well as record some new music with Chali 2na. Doors open at 5 p.m. on Nov. 26 for the show, which begins at 7 p.m. Tickets are $30. The Coach House is located at 33157 Camino Capistrano. For tickets or more information, call 949.496.8930 or visit www.thecoachhouse.com.